I opted to start this hike from the Hazard Road entrance. After following the entrance road into the property I came to a sign with a trail map on it. Shortly after the sign I followed a path to the left and then almost immediately left again and followed the Southwest Trail as it meandered uphill to the General Hazard Overlook. I spent a few moments here watching the sun set over Newport before I continued the hike following the outer perimeter of the park. I then followed the Swamp Maple Trail walking along the boardwalks until I got near the main entrance. I came across some deer tracks in the snow at this point. I turned right here and stopped at the Quarry Overlook. 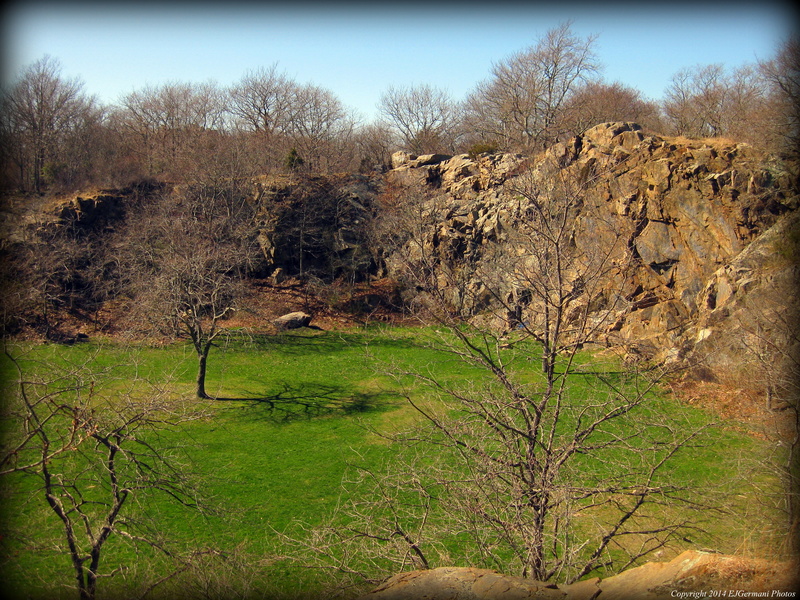 This is a shear 30 foot cliff overlooking an open meadow and vernal pool. Note that there is no rock climbing allowed here. On this particular day there was plenty of activity below. Volunteers were setting up for the 9th Annual Illuminated Garden event. I then continued my hike going by a large rock outcrop and then turning left to follow the Quarry Rim Trail back to the entrance road and to the end of this hike. If you would like to add more distance to this hike there are a couple other trails to explore. The Friends of Ballard Park protect and preserve this property and apparently several events happen here each year. Trail map can be found at: Ballard Park.